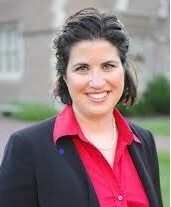 Dr. Sarah Hartz is Assistant Professor of Psychiatry at Washington University in St. Louis, MO. Dr. Hartz holds a PhD in Statistics from the University of Illinois Urbana-Champaign (2003), and she performed her residency in Psychiatry at the University of Iowa Hospitals and Clinics and Washington University/Barnes-Jewish Hospital (2005-2009). 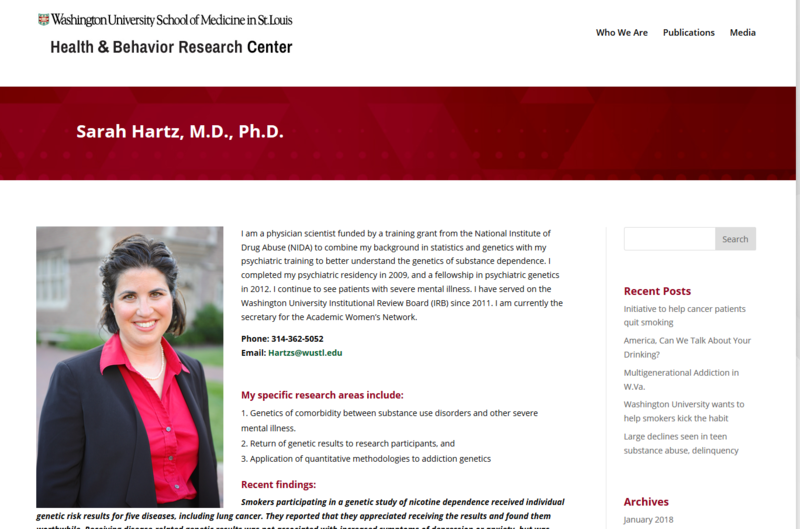 Dr. Hartz is currently a physician scientist who has combined her background in statistics and genetics with her psychiatric training to better understand the genetics of substance dependence. Dr. Hartz's current research interests include 1) genetics of comorbidity between substance use disorders and other severe mental illness, 2) return of genetic results to research participants, and 3) application of quantitative methodologies to addiction genetics. Walters, RK, Polimanti, R, Johnson, EC, McClintick, JN, Adams, MJ, Adkins, AE, Aliev, F, Bacanu, SA, Batzler, A, Bertelsen, S et al.. Transancestral GWAS of alcohol dependence reveals common genetic underpinnings with psychiatric disorders. Nat. Neurosci. 2018; 21 (12): 1656-1669. PubMed PMID:30482948 PubMed Central PMC6430207. Chen, LS, Hartz, SM, Baker, TB, Ma, Y, L Saccone, N, Bierut, LJ. Use of polygenic risk scores of nicotine metabolism in predicting smoking behaviors. Pharmacogenomics 2018; 19 (18): 1383-1394. PubMed PMID:30442082 . Johnson, L, Ma, Y, Fisher, SL, Ramsey, AT, Chen, LS, Hartz, SM, Culverhouse, RC, Grucza, RA, Saccone, NL, Baker, TB et al.. E-cigarette Usage Is Associated With Increased Past-12-Month Quit Attempts and Successful Smoking Cessation in Two US Population-Based Surveys. Nicotine Tob. Res. 2018; : . PubMed PMID:30304476 . Hartz, SM, Oehlert, M, Horton, AC, Grucza, RA, Fisher, SL, Culverhouse, RC, Nelson, KG, Sumerall, SW, Neal, PC, Regnier, P et al.. Daily Drinking Is Associated with Increased Mortality. Alcohol. Clin. Exp. Res. 2018; 42 (11): 2246-2255. PubMed PMID:30281161 PubMed Central PMC6214719. Salloum, NC, Buchalter, ELF, Chanani, S, Espejo, G, Ismail, MS, Laine, RO, Nageeb, M, Srivastava, AB, Trapp, N, Trillo, L et al.. From genes to treatments: a systematic review of the pharmacogenetics in smoking cessation. Pharmacogenomics 2018; 19 (10): 861-871. PubMed PMID:29914292 PubMed Central PMC6219447. Ramsey, AT, Chen, LS, Hartz, SM, Saccone, NL, Fisher, SL, Proctor, EK, Bierut, LJ. Toward the implementation of genomic applications for smoking cessation and smoking-related diseases. Transl Behav Med 2018; 8 (1): 7-17. PubMed PMID:29385591 PubMed Central PMC6065540. Hartz, SM, Horton, AC, Oehlert, M, Carey, CE, Agrawal, A, Bogdan, R, Chen, LS, Hancock, DB, Johnson, EO, Pato, CN et al.. Association Between Substance Use Disorder and Polygenic Liability to Schizophrenia. Biol. Psychiatry 2017; 82 (10): 709-715. PubMed PMID:28739213 PubMed Central PMC5643224. Hartz, SM. Capsule Commentary on Gryczynski et al., Validation of the TAPS-1: A Four-Item Screening Tool to Identify Unhealthy Substance Use in Primary Care. J Gen Intern Med 2017; 32 (9): 1026. PubMed PMID:28721534 PubMed Central PMC5570757. Hartz, SM, Horton, AC, Hancock, DB, Baker, TB, Caporaso, NE, Chen, LS, Hokanson, JE, Lutz, SM, Marazita, ML, McNeil, DW et al.. Genetic correlation between smoking behaviors and schizophrenia. Schizophr. Res. 2018; 194 : 86-90. PubMed PMID:28285025 PubMed Central PMC5811408. Carey, CE, Agrawal, A, Bucholz, KK, Hartz, SM, Lynskey, MT, Nelson, EC, Bierut, LJ, Bogdan, R. Associations between Polygenic Risk for Psychiatric Disorders and Substance Involvement. Front Genet 2016; 7 : 149. PubMed PMID:27574527 PubMed Central PMC4983546.